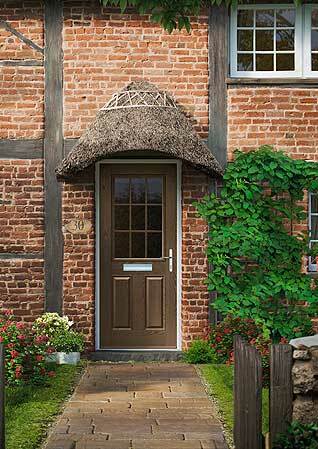 New Leaf Windows and Doors now offer a stunning range of replacement composite entrance doors. Manufactured to the highest standards by Door-Stop, these beautiful doors combine the look and feel of timber, with superb weather resistance and energy efficiency, low maintenance, and high security. The range is simply enormous, with custom options for the design, frames, colours, glazing and hardware, making it simple to find a door to perfectly suit your home. Now, you can also custom design your own door. Take as much time as you want to design the door to suit your house and your requirements using our Custom Design Your Door online system. This gives you the opportunity to customise your replacement door to suit your house perfectly, and you can take as long as you like to get it how you want. Once you've completed the design you can upload it and send it to us for a quotation. And if you're not 100% sure, you can simply save the design and come back to it later. The Door-Stop doors we supply and fit are police security approved and tested to the highest standards of weather resistance. They come with a really comprehensive guarantee, which includes the security aspect. Energy efficient, beautiful looking and with a choice of styles, colours, finishes, glazing and hardware, you simply will not find better. Let us improve your home, but let you choose how you want it to look. Alternatively, please call us on 01536 601292 or 07720 626165, or click here to email us for more information.